Si le cadre est trop rigide, rien de nouveau ne sera créé. Et si le cadre est trop large, rien d’utile ne sera créé. 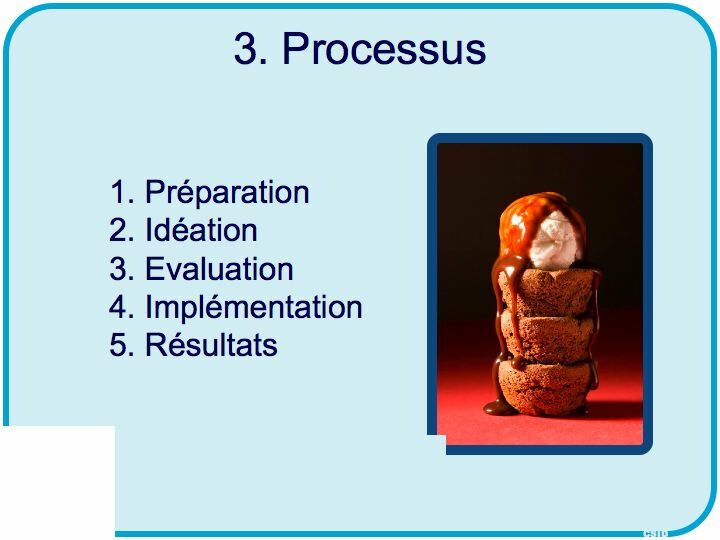 Alors il faut que le processus de l’innovation soit clair dans son ensemble ainsi qu’à chaque étape, mais sans étouffer ceux qui innovent. Attention, structuré ne veut pas dire « compliqué » ! A chaque étape vous avez le choix entre des outils plus ou moins structurés. Ceci est spécialement vrai pour l’idéation où l’éventail va du subjectif-intuitif jusqu’à la grille fonctionnelle. Les outils structurés sont néanmoins souvent plus efficaces, mais pas toujours. Vous allez créer un équilibre délicat qu’il faudra réajuster régulièrement. Erreur : Je n’ai pas le temps et je saute cette étape, par exemple j’organise des brainstormings sans préparation, sans définir question et objectif de la session, sans envoyer bien en avance le sujet aux participants. Pour trouver la bonne idée, je dois d’abord poser la bonne question. Coming up with the right question isn’t easy. There may be an “a ha” moment in the shower, but many times the right question comes from conducting substantial market research, combing analogous industries for inspiration, holding structured discussions with experts, and having thoughtful discussions about a company’s real strategic constraints and objectives. Sometimes these efforts feel frustratingly disconnected with the charge of creating an innovative growth business, but the right framing can make the right answer self evident. The next time you or your team start generating ideas, stop. Step back. Make sure you’ve thought about the question you’re trying to answer. Trust me: it will be worth the extra time. Erreur : J’utilise toujours le même outil pour toutes sortes de problèmes, sans distinction. These goals vary between improvements to products, processes and services and dispel a popular myth that innovation deals mainly with new product development. Erreur : Je prends des décisions irrationnelles, sur le tas ou dans l’urgence. Erreur : Je ne fait pas de tests. Erreur : Je crois qu’il suffit d’avoir les moyens pour que cela marche. Innovation and change: What are you afraid of? Expect resistance: Know that any new idea will be challenged. There will be people who don’t like it, no matter how good it is. Realize this is natural and keep going! Make it real: Build a prototype and show people how it works. Once there is a physical example and people can understand it better, they’ll be less afraid. Sell the benefits: Show everyone why the new idea is better. Let them see what’s in it for them. Salesmanship is an important part of innovation.Never expect an idea to sell itself. Get support: Form a team around you who are enthusiastic and want to get the idea done. Embrace anyone who ‘gets it’ and make them your new best fried. Start small: Look for easy ways to introduce the idea. Make low-cost introductions and limited runs of products so that you can easily enhance and change as you get feedback from the market. It is easier to make a number of little bets, and then follow up the ones that work best and dropping those that don’t. En Suisse, nous avons tendance à nous perdre dans les trois premières étapes qui sont la préparation, l’idéation et l’évaluation. On attend trop longtemps avant de faire le premier pas vers l’implémentation parce que nous croyons qu’il faut être à 100% prêt et avoir tout prévu et anticipé. Mais si nous attendions toujours d’être prêt à 100% avant de faire quoi que ce soit, rien ne serait jamais réalisé.